One of the largest water garden nurseries in Australia specialising in both exotic & Australian native aquatic plants. Our extensive range include waterlilies (hardy & tropical), lotus, marginal plants, water irises, aquatic cannas, edible aquatics, deep water aquatics, creeping aquatics, wetland reeds/rushes/sedges, rare pondside plants and aquarium plants. All plants are sent soil-free by mail or delivered as potted established stock. We supply to the public, trade (within Australia) and botanic gardens around the world. 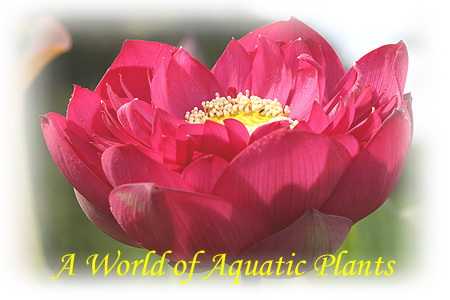 The ONLY Australian nursery to stock internationally certified waterlily cultivars. ONLY genuinely certified stock would carry the logo or image below. Please look for the "Certifying Member" logo when purchasing waterlilies. Click on the above image to find out more. Please note: During the peak periods, orders may take up to 2 weeks to process & dispatch. In the event of extreme weather conditions, we may delay sending out live plants. See our latest INTERNET SPECIALS. See our new and recent plant releases on the NEW RELEASES page. Find out the latest news and updates on our Facebook page. "Flat-Rate" standard postage & packing charges start from $14.40 per order.